When Catherine Cooper settles in the Hamptons on the heels of a nasty split from her long-time husband, the luxurious coastal community seems like the perfect place to get back on track in style. But as Cat soon discovers, starting fresh on the East End can be deadly . . .
Cat Cooper never imagined selling off her mega-successful marketing firm would mean going from the pinnacle of success to a walking hot mess. Gouged from an unexpected divorce, Cat suddenly finds herself struggling through a new career as a business-savvy life coach for the hopelessly adrift in East Hampton and contending with Heather Holland—a spiteful neighbor who will do anything to bully her out of town. But her second act may very well continue behind bars when Heather’s dead body turns up next to a shattered punchbowl . . . and Cat’s pinned as the murderer. Given Heather's mean-girl reputation, the pool of suspects looms large, but was likely a guest at Heather's invite-only luncheon before committing the crime and planting Cat’s punchbowl next to the body. 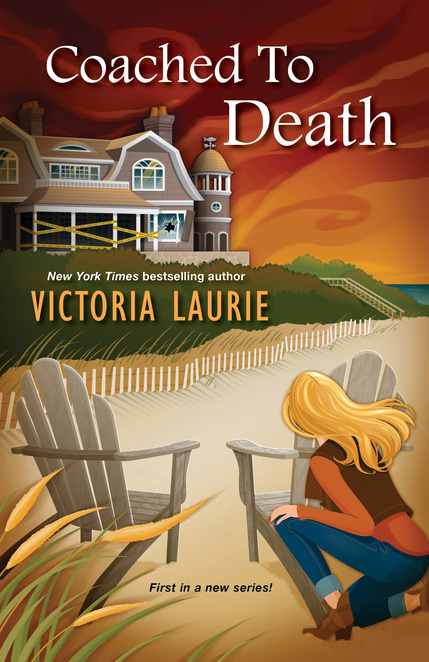 Determined not to trade designer duds for an unflattering prison jumpsuit, Cat sides with her best friend Gilley to scour chic boutiques and oceanfront mansions in search of the criminal who framed her. With a stoic detective looking to get her in cuffs, Cat must sort out her own issues in time to stop a the Angel of Death from striking again . . . When Catherine Cooper settles in the Hamptons on the heels of a nasty split from her long-time husband, the luxurious coastal community seems like the perfect place to get back on track in style. But as Cat soon discovers, starting fresh on the East End can be deadly. . .